As I was approaching the new year, I knew that I was going to focus on a healthier me. And that, of course, would mean changing my eating habits. When I saw this book up for review, I was over-the-moon and chose it straight away. I wasn't familiar at all with the Daniel Fast while coming into this review. I was so super thankful that Kristen explained it, in detail, in this book. It always makes me so happy when books are in "every day" language that is easily understood. The Fast is explained as eliminating commonly enjoyed foods for twenty-one days as an act of worship and of consecrating oneself to God. The book is divided into three parts and includes over 100 recipes and a 21 day devotional. Part 1 is about the Fast itself, Part 2 is all about where you should focus your heart during the Fast, and Part 3 is about the food that you will be eating and what to avoid. 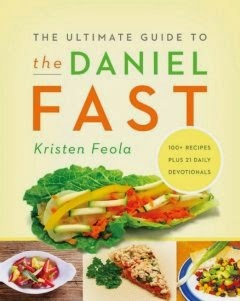 If you have ever considered the Daniel Fast, you have got to get this amazing instructional book. Kristen delivers a heart-felt walk through this book to encourage you as you pray your way through your fast.